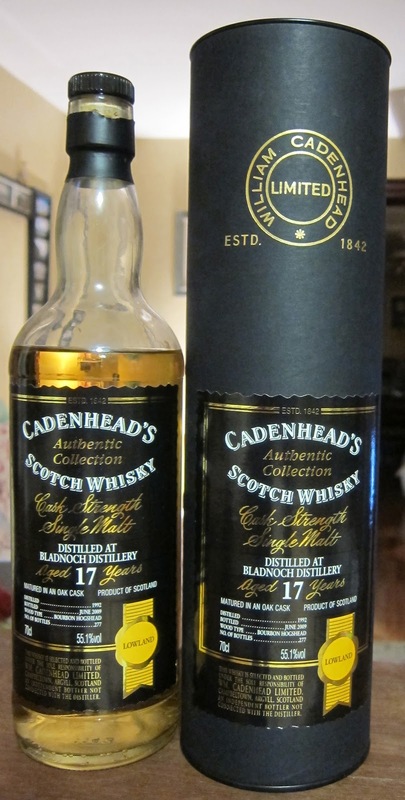 Cadenhead's Authentic Collection Bladnoch 17yo (55.1%): To be honest I spent quite a time thinking before I purchased this Lowlands gem. It took me two days and several hours in Anverness, the amazing whisky shop in Antwerp, to narrow down my list to one bottle. And what a decision it was... A totally unique cask distilled in 1992, aged 17 years in bourbon hogsheads and bottled in 2009. I will do my best to keep this bottle as long as possible in my cabinet. Color: Clean straw, Chardonnay. Nose: Like being on a malting floor right after they sprayed the barley with water, or like sniffing the malted barley samples from a glass jar in a distillery tour. Pungent orange and bergamot peels on top of these aromas followed by unripe almonds and wet grass. Palate: Rich, thick, mouth watering barley. With a few drops of water it gets even maltier, a real barley feast with delicate floral honey and lemon zest notes. Finish: Medium long. Burnt pie crust, lemon meringue and barley cookies with mild vanilla flavors. Awesome..! Overall: This dram must be the Wikipedia definition of a good plain single malt scotch whisky. Absolutely nothing fancy, complicated or pushy about this dram but it is perfectly balanced and just beautiful. More like Franz Beckenbauer of the scotch whiskies. Bunnahabhain Darach Ur Batch no. 4 (46.3%): When I was on my way back home last week Istanbul Airport was the last duty free area I had the chance to spend some time in. I was trying to find a decently priced travel retail exclusive bottle to bring back. 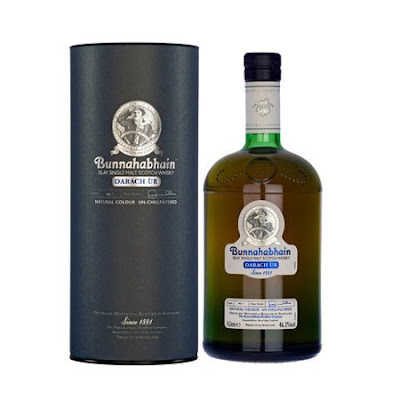 I really enjoyed this year Bunnahabhain's newly restyled non chill-filtered %46.3 abv 12 yo expression and therefore I didn't think too long what to buy after I saw this bottle on the shelf. Darach Ur means new oak in Gaelic. This whisky has no age statements but contains a mixture of single malts aged up to 20 years and is matured in new oak barrels coming from Kentucky. Color: Coppery, dark amber. 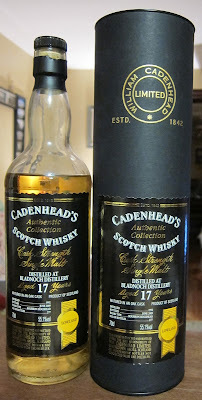 Nose: Quite heavier than I would expect from a Bunnahabhain. Spoiled, candied prunes, raisins and damp, moldy cellar notes. Wet mop and wet lightly toasted wood. I kind of missed the lovely butterscotch nose of the regular expressions. It is covered a little too much with sherried aromas. Palate: Sweet and sherried but balanced with citrusy notes and spices like cinnamon and nutmeg. It gets quite salty and briny towards the end. Finish: Long and salty. Finally Islay style salty sea breeze shows up as the coda. Overall: Not exactly what I expected and we didn't get along together in the beginning but it starts to grow on me slowly. Maybe because it is not quite a summer dram and lately it's been pretty hot here. Definitely a different Bunnahabhain and not your every day whisky. I would sip it as the last dram of the night.